There are times when the simplest ingredients combined in the right way turn out into a fabulous and amazing plate – that almost everybody likes. 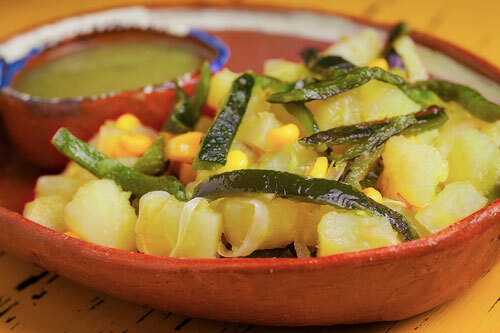 That’s exactly what happens with this recipe, where the main ingredients are the potato and the Poblano pepper. What you are about to see on your table are some potato dices, which are mixed with chili and onion strips. But that’s not all because the potatoes with peppers also have corn’s sweet flavor. A true delight! This potatoes with peppers are an excellent appetizer that is mainly used to accompany main courses . Although the speciality of this garnish is accompanying beef dishes like the arrachera , cecina , grilled steak , etc. – If you want to take this recipe further... it can be served as main course, ideal for vegetarians. It could also be used to fill burritos. In this recipe many steps have to be followed and you will work in different stages. The good news is that all this procedure is easy to perform. Beware because in this recipe the Poblano peppers are roasted and your kitchen may fill of smoke. To prepare this recipe we recommend buying canned golden corn. The dish will be ready in 30 minutes . The recipe is for 5 portions. The enough Water to cover the potatoes. Leave the potatoes cooking in the boiling water for about 20 minutes, until they soften. Cut into strips the Poblano peppers with the ones you worked and reserve. Verify that the potatoes that were left cooking are soft, if not cook them for a longer time. To know if the potatoes are ready, spear a fork in the potatoes. When you feel that the fork goes in and out smoothly the potatoes are ready. Remove from the saucepan, with the tongs, the 3 potatoes that were cooked and rinse them with cold water. Peel the potatoes that were rinsed. Dice the potatoes that were peeled, then reserve. Cut 1/2 onion into strips, then set aside. The strips of the Poblano Peppers that were cut. The dices of the Potatoes that were cut. Mix the potatoes with peppers and fry them for about 5 minutes, until they are well fried; stir regularly. Tip: If you want to add a subtle flavor to the dish sprinkle some grated fresh cheese over the potatoes with peppers. Suggestion: With a plate like this, it is good to have handy some corn tortillas. Did you like the Potatoes with Peppers? Use long tongs to move the chilies like this “OXO Tongs"; they are resistant and they have a very good grip. Buy this bamboo chopping board it is super resistant and it is easy to wash. If you want to cook with the best skillets and saucepans that there are – the “Woll Diamond Plus Cookware" is for you. In this cookware nothing sticks and it really uses diamonds to make it more resistant and to conduct heat better.